That endless search for small missing shoes may well be a thing of the past. This nifty little gadget keeps shoes together when in storage – and as an added bonus, can help teach kids left from right. No matter how great your shoe storage solution is – it’s almost a given that as the mad morning rush out the door ensues, one of the kids won’t be able to pair their shoes. And those little kicks can be really good at finding hiding spots: under the couch, under a bed, in the dog’s mouth. This very simple, but ultra clever idea will put an end to the search for the missing shoe. Wear A Pear shoe snaps were, of course, dreamed up by a mum who was as fed up as the rest of us with missing shoes. 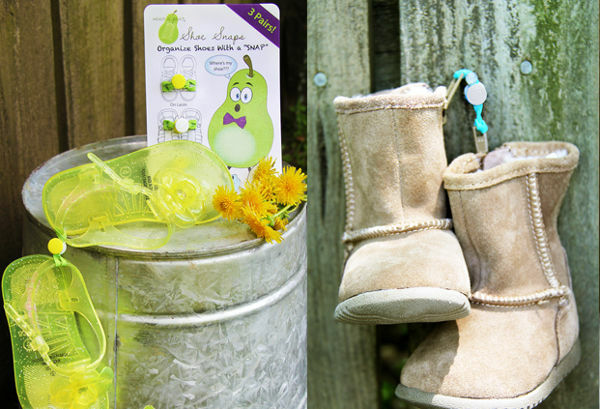 Wear A Pear snaps are designed to keep the shoes together when they’re not being worn. They can then be stored, or even hung on a hook (away from that dog!). The snaps attach to shoes and even a four-year-old can easily snap each one together and unsnap them when the shoes need to be worn. They are also colour coded, with one white snap and one coloured – so it can help children learn the left shoe from the right. A three pack of Wear A Pear costs US$7, plus postage to Australia.